My good boy DC. Owned & loved from 1994-2010. Although I’m not a psychologist or minister, I’m happy to tell my story about horse bereavement in the hope that it encourages someone else. 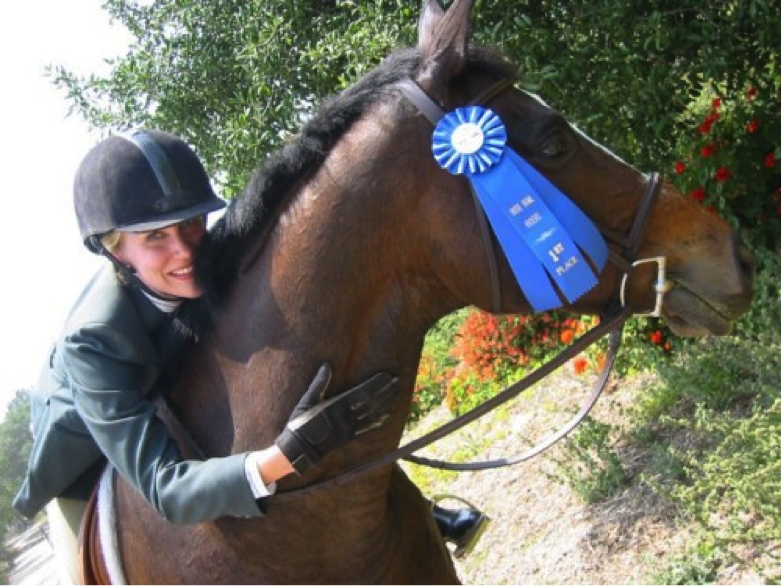 I want to share what helped me get through a difficult era in my horse-loving life when I suddenly lost my beautiful steed of 16 years to colic. Every person is unique so this is not a “must-do” list. There is no fix. These are just my thoughts on what helped me feel a little bit better (if even only temporarily). Think of this as sisterly advice. Take what is helpful and leave the rest. 1. Cry I cried for days and weeks after my sweet DC died. I remember it feeling like a literal weight was on my body. I’m not generally much of a cry-er, but I made up for it following his death on November 1, 2010. I’ve cried many times since then such as when writing about him. Just thinking about my heart horse or looking at an old picture would be a trigger. I decided to stop feeling silly for crying over “just a horse,” because he was more than an animal I owned for 16 years. He was a confidant, comedian, and adventure partner, to name a few roles he held. 2. Know It’s Okay to Take a Break from Horses Speaking of triggers, it was hard to be around other happy people with their horses and so I stopped riding. I pretty much did not ride for about four years. I knew I would return to it someday, but I didn’t have the heart to invest my emotion again. My dad went to the barn to pick up my bridle, saddle and tack trunk with all my horse gear. It stayed in the garage for a long, long time. It was fine out there. 3. Go to Work (or School) I remember the morning we had to euthanize DC I said to my husband, “I don’t know what I’m supposed to do right now.” He said I should go to work–that staying home wouldn’t help anything. I made it to school crying for most of my hour commute. When I got there I remember feeling a sense of relief. It was like play acting. I didn’t tell my students and I went through my day just like any other. While I was engaged with the students, my brain couldn’t “go there” meaning I was able to have a breather from my grief. Keeping on my normal routine was helpful. 4. Take a Risk and Tell Non-Horse People in Your Life About halfway through that horrible day I confided in another teacher about my loss. I didn’t know her very well, but I knew she was not a horse person. I was astonished at just how compassionate her response was. She seemed to really grasp the full weight of my sorrow and in fact, offered to cover my afternoon classes for me (with another teacher). I was able to end my day a bit early without having to take official time off. There was not a single non-horse person I shared my loss with who tried to diminish my sadness. 5. Write a Eulogy I sat down to write on that fateful day and composed a full-blown horse eulogy. I then emailed it to my close family, friends, and anyone I’d known from previous barns over the years who’d had a connection with DC and me. I received some of the most beautiful, encouraging words in response to my message. It felt good knowing I was not the only one who loved that horse. Having little pieces of other people’s sadness to mix in with my own huge pot was some comfort. I knew I wasn’t alone. 6. Don’t Feel Guilty Being Sad Another thing that I struggled with was feeling guilty that I was so distressed over losing a horse when other people had lost a spouse or child, job or health. I thought on a grand scale about all the hurting people in the world–refugees, child laborers in factories, people persecuted for their faith and felt like my Problem was so small compared to real PROBLEMS. I can’t remember which friend assured me it was okay to feel my feelings on this one, but someone set me straight insisting that it’s okay to mourn loss–it’s part of the human experience. 8. Find Comfort in Faith I’m a Christian and my faith is important to me. I know there is no biblical evidence that animals go to heaven. However, I also know that Scriptures teach “His eye is on the sparrow.” If a loving God cares about sparrows, wouldn’t He also care about noble, beautiful horses? And surely He cares about the heartbroken horse mourner. The book of Revelation states that in the future Jesus will ride on a white horse. Hmmm. . . wouldn’t that mean horses are in heaven? Perhaps you are of a different religious tradition or not particularly religious. Yet maybe there is a spiritual truth or faith practice that would help you. In a book called Mudhouse Sabbath the author Lauren Winner outlines Judaism’s mourning path which consists of a series of rituals over the course of a year and then an annual acknowledgment. I appreciate these words: “This calendar of bereavement recognizes the slow way that mourning works, the long time it takes a grave to cool, slower and longer than our zip-zoom Internet-and-fast food society can easily accommodate. Long after your friends and acquaintances have stopped paying attention, after they have forgotten to ask how you are and pray for you and hold your hand, you are still in a place of ebbing sadness. Mourning plateaus gradually, and the diminishing intensity is both recognized and nurtured by the different spaces the Jewish mourning rituals create.” If fox hunts host annual “Blessing of the Hounds” ceremonies, perhaps it’s not ridiculous to think of a way to commemorate a dearly departed horse. 9. Attempt New Activities Outside of the realm of horses, there are a whole host of wonderful pastimes. I had been a lindyhopper for several years before DC died, but after he was gone, I was able to get more involved in dancing pursuits. My husband and I starting attending swing dance camps and workshops. They’re really fun. Not on the same level as riding fun–never a replacement hobby–but fun nonetheless. And good exercise! An unplanned ride on my friend’s TB McLain last year this time placed me on the horse path again.